Where else can you find London, Paris, Poland and Cook Islands together on one island? Where the officials are brave enough to be picked up in a Dinghy at the beach where the waves are breaking? Where 5 officials want to come to your boat and have to be picked up and brought back - through the breaking waves in movie like stunts - in 2 groups? Where these officials laugh when they arrive at your yacht soaking wet saying "that was fun" when you said "wow that's quite dangerous". Where the officials ask you for 5 copies of your papers, ask you to copy their paperwork so they don't have to do it in their office, where the only one who really works is the lady from immigration putting her stamp into your passport. 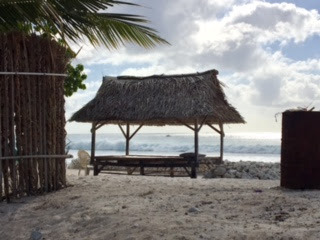 Where you anchor outside the atoll, in the northwest just off of the town London, in the open ocean enjoying the rolling swell coming from the ocean and meeting the windwave coming from the opposite direction building up in the lagoon. At least we're not alone. Our neighbours are 2 freighters, a big fishing vessel, an interisland ferry and a navy ship used for coast guard / police. Where one side of the island is called "Wreck Bay". Where not only one sailing vessel has been washed ashore while the owners just shortly went ashore to check out. One of those boats, whose wreck now decorates the entrance of a hotel, is known to us. We met them in Fiji in 2014. They were aboard Alita that time - and they stuck to Marcus' head because of the unusual construction they had made on the back of their Beneteau. Where if you want to go ashore you have the choice of riding through the breaking wave over flat rocky waters to the beach (on days like today impossible) or through the passage - over 2 shallow areas with breaking waves and ocean swell directly against windwave and, what happened to us, strong current - which is quite challenging and slightly dangerous as well (to me scary as hell; I wanted to turn around). Where the locals smile and greet you when you arrive at the beach asking where you're going. Making sure they have enough time to steal fuel from you. When we beached the Dinghy one guy had that look on his face and he stuck his head to the Dinghy in such a way I felt he was looking for our big fuel tank. That alerted me and reminded us we need to lock the tank to the Dinghy. And we locked the Dinghy to a tree, which does not help much. Well, at least they left enough fuel in the Dinghy for us being able to return to Alita. Where a local - who does not know you other than he picked up your crew member yesterday and rents him a beautiful little Stand-alone hut in his "hotel" area with excellent service - comes to the Telecom shop with his truck to loan you 26AUD so that you can buy 2 SIM cards and Top Up for internet because you took the wrong wallet with you and left the AUD cash on board and it is impossible to go back to the boat and return. The Telecom shop was about to close and there was no way we would go back and forth again since it took 45 min one way and too dangerous and the shop would be closed anyways. This nice guy from Rainbow Enterprise, Simi (call him on channel 67) took us on the back of his truck, drove us to his hotel where we found Rolf relaxing at his hut. We were served a very good tuna lunch- oh boy and we were so hungry that we almost finished the huge portion. He trusts us to get his money back. Actually he will send his diving boat out to us on tuesday to pick up the cash and bring us coconut- so that we don't have to come ashore. Very nice of him. He made a deal out of our money need by selling us a (I have to admit excellent) lunch. Win-win situation. Haha. Once on land it's quite nice and peaceful. A long white sandy beach basically surrounds this island. In would love to explore the inner lagoon, but we won't. Too big, too far, too much wind and waves, no fuel. 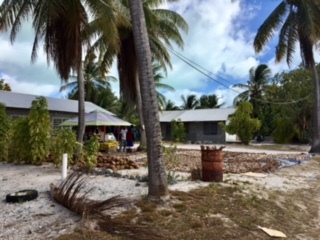 The houses here are by far the simplest I have seen on all islands we have been to. The island is kept mostly clean. They are lucky they have white sand instead of darker mud like so many other places. About 7000 people live here (that's what customs said). It is very dry with the last real rain having happened about 7 months ago (so I was told). Australia and New Zealand are putting money in here as well- into schools and government buildings. China of course is here as well. So far I have only seen one truck donated by Taiwan - China. And I won't see more cause I can't go to land. I can't even swim ashore through the waves as they are breaking over stones im flat water. That's too dangerous. I don't mind breaking waves over sand , but not over stones. Generally people seem very friendly and greet you off their motor bikes and out of the cars. Looks like some Indians have moved here from Fiji (I talked to one). 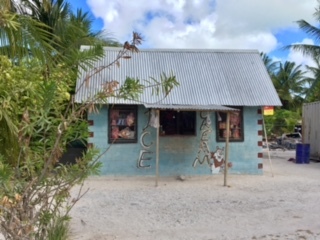 Many of the little shops are run by Indians. People here seem to be a mix of many races / cultures. They have a very distinct language. I found some similarities to the Bislam in Vanuatu, but it sounds a bit more asian. I have no idea, would have to research. 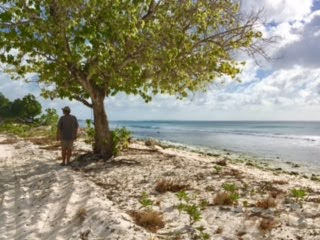 Interesting challenge for us is that the time zone for Kiritimati is the same as for the whole Kiribati islands- so a day ahead. So we're on the same time as Penrhyn and Hawaii, just a day ahead. We get that day back when we sail to Hawaii. Haha. We simply don't change our board time. 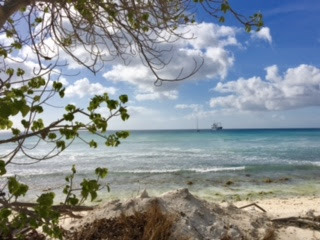 This morning at 9.10am, after 4 3/4 days Passage, we safely dropped anchor at Christmas Island. In the meantime I cleaned the boat and went into the water to cool down and refresh. Just now, at noon, finally the officials called us on the radio to come pick them up at the beach. Marcus is in his way. It's not a good anchorage nor is it good to get to land. We're outside in the waves. Marcus and I want to go on to Hawaii as soon as possible, which is either tomorrow or in a week. This could mean christmas at sea...Will keep you posted. We're about 72nm south of the equator, so passing around noon time. Let's see if I jump in just for the fun. But then again, we would have to take all the speed out and the waves are pretty bad, so probably won't jump..
We're have 180nm to go, so estimated arrival time is noon on dec 7, respective dec 8 local time as Kiritimati has set it's clock forward one day to be with the rest of the Kiribats. We continue to rush and bounce our way through the ocean. All well on board. 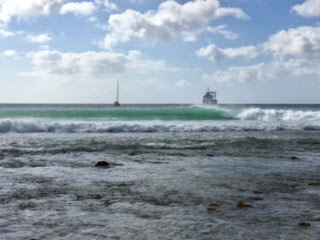 We are still sailing with 4-5BF winds and against quite a wave so still bumpy. But we're good underway with the small Genoa that we had bought in NZ as replacement for the big one that we had used all those years before and had started to badly delaminate. From NZ until Penrhyn we had sailed with the original genoa that we still have but knowing this trip is against the wind all the time with 4-6BF we changed to the smaller one in Penryhn which was a good decision. Around noon we officially left the hurricane danger zone. And in 1,5?or so we'll go from spring to fall by crossing the equator. All good on board. It's been a bit over a day since we left Penrhyn. The ride is a bit bumpy and we're sailing in 4Bf against the wind, but all good on board.